Over the last few weeks, we have had numerous inquiries coming from Ghana regarding pilot training opportunities there. As things stand so many people out there want to explore aviation opportunities and yet there is no information available on hand to guide them or point them in the right direction. Following these inquiries we realized, we had no information on hand for most of the enquirers as most of our focus to date has been in Southern Africa. Seeking to remedy the situation, we took to the world wide web to gather as much information as we could on Ghana. We looked into its aviation system and job prospects, so we could better offer counsel to the hundreds of aviation enthusiasts in Ghana who want their dreams to take flight. In the process of research, we came upon an article that we believe better explains, pilot training and its realities for the African aviation enthusiasts. Whilst it is more or less a case study of Ghana, it encompasses the realities of most of the aviation sectors in Africa. Enjoy the article below and get in touch with us at the end to let us know where you are in your aviation journey and if this article was helpful. As you read, may you be enlightened and may you find hope and faith, that indeed… “Yes We Can Fly”. Being an airline pilot is a glamorous, exciting, and could be a highly rewarding job. But how exactly do you become one? I have been in the situation, as a young lad always gazing up in the sky wondering, when I would blaze the sky with contrails from a 300-tonne metal contraption, zooming at 575mph and 37,000 feet above sea level. The sheer joy and exhilarating experience of flight, coupled with the tremendous responsibility of knowing that the lives of more than 300 passengers depend on your skill, knowledge, and judgment as a pilot can be very humbling. I have met a lot of young people with a strong desire to become airline pilots in Ghana and most of them grapple with demystifying the process of becoming an ‘airplane driver’ in Ghana. Since every country might have its own generic regulatory and training required in order for one to become an airline pilot, I would try to sum up in general what pertains both in the U.S Federal Aviation Administration (FAA) system and that required by the International Civil Aviation Organization (ICAO) member countries of which Ghana is a member. Ghana like any developing country has had a stunted aviation industry and with the ripple effect of a petrol-economy due to the recent oil find is expected to have a prolific aviation industry. This will mean more air travel for a progressive middle class, air support for direct oil drilling industries and business aviation for big oil multinationals. One component of this projection is having a well resourced and professional squadron of competent and safe pilots. Traditionally, pilots in Ghana were trained by the erstwhile Ghana Airways and The Ghana Air force. There were the direct entry pilot trainees who were recruited and trained overseas (Mostly at Oxford in the UK). There was also and the spill over’s from the Ghana Airforce, who were retrained to join the pool of professional airline pilots. There were those who chose the very expensive path of self-training to become professional pilots. With the demise of the national carrier and the huge cost of training professional pilots, coupled with the trickle inflow from the Ghana Air force outlet, most prospective pilots have to shell out their own resources to train to become professional pilots. Pilot training is a very expensive venture and on the average, for one to get the basic commercial pilot license with instrument and multi-engine rating will be financially drained to the tune between 85,000- 150,000 USD depending on where the training was conducted. Then there is the other aspect of type ratings on specific aircraft types and the required Airline Transport Pilot license (ATPL) which with its stringent requirement, can make any prospective airline pilot financially unhappy ( 10,000-45000 USD). With all this cost, one would have to know whether there are any return on investment and its attending glamour in training to be a pilot in Ghana. The actual process of ultimately finding oneself in the complex flight deck of a modern airliner takes a long time and much dedication; it also means meeting precise requirements and can be a fairly expensive pathway. For some airline flight crew positions, it can take up to 10 years of flying experience to even qualify. Needless to say, you need to be serious and committed. I would start with my emphasis on some level of formal education. An aspiring pilot may probably want to start with a solid educational base and while a college degree may not be required to fly for some of the smaller airlines in the United States and worldwide, a four year degree is required to fly for major US airlines and bigger carriers worldwide. It is highly recommended to get a Bachelors degree with an emphasis in aviation (but your degree doesn’t necessarily have to be aviation related). Airline pilot training is intense and expensive. A college degree helps to demonstrate to the airline that you will be capable of completing their education program and also boost one’s human capacity for leadership and future managerial roles. A college degree also gives one a viable option and alternate if, in future, flying does not yield the interest and financial dividends anticipated. One will also like worthy insurance against furloughs (layoffs) and loss of flight crew privileges due to medical conditions. A college degree would also create the capacity for further studies in aviation, which can lead to future roles as an aviation consultant, academic faculty positions and as an aviation policy maker. For those who desire to just jump into the cockpit, normally there is flight training school at local airports and fixed base operators, where one can get flight instructions from a certified flight instructor, to begin working on the private pilot certificate. In the US, The FAA minimum flight time is 40 hours, but the average is around 60 and it may vary in other countries. Schools with FAA oversight can be more desirable if you want a highly regimented training program. In Ghana, the Ghana Civil Aviation Authority (GCAA) has regulatory oversight for aircrew licensing and one would have to be trained by a GCAA certified flight instructor at an approved GCAA aviation training organization (ATO) to be eligible for any GCAA issued a license. Presently there have been a number of private pilot training schools cropping up in Ghana, and a check with the GCAA, can provide a list of accredited ATO that can facilitate training. If a Ghanaian decided to train abroad and presents a foreign aircrew license, in order to work as a professional pilot in Ghana, the GCAA will have to conduct a process of aircrew license validation. The prospective candidate would have to go through a series of examination and medical checks, to get the license validated. The pilot will then be granted the necessary rights to operate as an aircrew member. A prospective pilot trainee would require a first Class medical certificate from a GCAA approved medical examiner. It is better to apply for a first class medical the first time you apply for a medical certificate to be sure you will qualify for one before you have invested too much time and money into your new career choice. Normally for airline career track pilots, after earning the private pilot license, the next step would be working on the instrument rating and commercial certificate. An instrument rating requires about 50 hours of cross country Pilot-in-Command (PIC) and 40 hours of actual or simulated instrument conditions. For the commercial certificate, one normally need 250 hours total time, 100 hours PIC, 50 hours cross country, and 10 hours of dual instruction in a complex aircraft. Normally pilots who are paid to transport passengers or cargo must get at a minimum, commercial pilot’s license with an instrument rating issued by the GCAA. Helicopter pilots are also required to hold a commercial pilot’s license with a helicopter rating. To build more flight hours and consolidate experience, most career track pilots, complete a certified flight instructor (CFI) rating and work as certified flight instructors for some time, while applying to join the major airlines. Some flight schools offer flight hours in exchange for instructing for them. This can be useful when one wants to cut cost during the multi-engine rating phase. Pilots need flight experience to qualify for higher license like the Airline Transport Pilot License (ATPL) which is now a requirement for most major carriers. To work for a major airline, you will typically need 3,000 hours total flight time including at least 1,500 hours multi-engine, and at least 1000 hours as pilot in command (PIC) of turbine (jet) powered aircraft, preferably in scheduled airline flying and in type of aircraft. These numbers are estimates and will vary depending on the airline. Also, while these may be the minimums required to apply for a job at a major airline, they may be far from the actual competitive numbers and the actual experience of successful applicants may be considerably higher than the minimums. 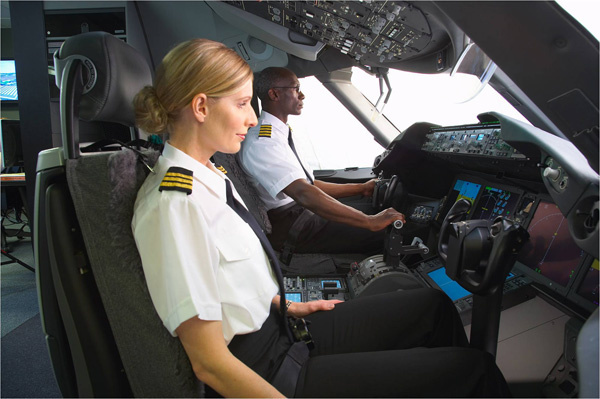 Initial training for airline pilots typically includes a week of company indoctrination; three to six weeks of ground school and simulator training; and 25 hours of initial operating experience, including a check-ride with regulatory aviation safety inspector. Once trained, pilots are required to attend recurrent training and simulator checks once or twice a year throughout their career. In the US, which I will use as an example, airline pilots must fulfill additional requirements. Recently, new regulations have made it mandatory for both Captains and First Officers to have an airline transport pilot’s license. Applicants for this license must be at least 23 years old and have a minimum of 1,500 hours of flying experience, including night and instrument flying, and must pass FAA written and flight examinations. Usually, they also have one or more advanced ratings depending on the requirements of their particular job. Because pilots must be able to make quick decisions and accurate judgments under pressure, many airline companies reject applicants who do not pass required psychological and aptitude tests. All licenses are valid so long as a pilot can pass the periodic physical and eye examinations and tests of flying skills required by the FAA and company regulations. Companies other than airlines usually require less flying experience. However, a commercial pilot’s license is a minimum requirement, and employers prefer applicants who have experience in the type of craft they will be flying. New employees usually start as first officers, or fly less sophisticated equipment. Depending on the type of aircraft, new airline pilots start as second officers and progress to first officer, senior first officer and captains. Many pilots begin with smaller regional or commuter airlines, where they obtain experience flying passengers on scheduled flights into busy airports in all weather conditions. These jobs often lead to higher paying jobs with bigger, national or major airlines. Another career track that can be considered is the military option track. One can consider military flight training. After some years in the military as a pilot (Normally 10-15 years bonded service), one can go back to civilian life and, once you have enough hours, qualify to fly with an airline. However the military medicals and requirements are very tough and stringent, but of ,course they pay for one’s flight training. Other options would be to go to a 4-year college such as the University of North Dakota and Embry-Riddle Aeronautical University in the US. Both schools offer flight training in concurrence with academic classes. There is a school in the UK, called Oxford Aviation and in Ghana, there is a flying school called Mish Aviation, but these are not collegiate programs. Prospective pilots need to do personal research into their tuition, accreditation and other fees. Some of the challenges of being an airline pilot are outlined below. One could have long absences from home and family and it would be a constant feature as part of the profession. One’s career will always depend on maintaining a current medical certificate. Flying as a career is a stressful job. A pilot’s ultimate responsibility, the safety of his/her passengers and/or cargo means making a lot of personal sacrifices – constant training and evaluation, constant drug and alcohol testing, background checks, difficult hours, long daysa , and a huge liability. One will have to do a lot of introspection before taking on this career. In recent years, US airlines have made cuts to pilot pay, days off, hotel quality and location, uniform expenses, medical and dental plans, and vacation time. Flight experience has been devalued and many pilots have opted to change careers altogether. Others pursue alternative airline positions that don’t involve ‘flying the line.’ One will always be taking written exams, oral exams, and check rides multiple times in a year for the rest of their career. And it will still entail performing stalls and steep turns on check rides as a Boeing 777 or Airbus 380 captain. Failing these checks can be an end to one’s airline pilot career. Failure of any airline training or checking event becomes part of one’s permanent airman record which is required, by law, to follow you to any new employer for your entire career. Anytime you change jobs, by choice or because you’ve been laid off or your airline has gone out of business, you will be starting at the bottom again at your new airline in terms of your position, schedule, and pay, regardless of experience. This used to be a very glamorous profession, but not anymore. Pilot’s pay has been slashed and they have to stay in the airport to board the next flight. If they want to relax they can sleep on operation desk pads. Often they also have to go for screening and pass the security check just like all of the passengers. In the US, a new airline pilot starts out at barely $20,000/year, and due to new legislation, they are also required to have the same minimum requirements as a Captain (1500 hours of flight time, Airline Transport Pilot License). You will now be required to spend more time to earn these minimums, make the same amount of pay as when the minimums were 500-1000 hours, and invest more of your life leaving less time to make more down the road. Passion will be a must because the logistics of these changes don’t make sense. All the above a very pertinent to aviation in the US and some aspects of it may apply in Ghana. There is, however huge demand for professional pilots in the fast evolving, high paying aviation industries in the Middle East and Asia. It is therefore prudent for anyone with the passion and inordinate desire to ride the sky in the metal bird, to count the cost and know what is in it. I would continue to challenge our aviation policy makers and tertiary educational institutions to team up with stakeholders, like the GCAA and Ghana Air force, to structure a curriculum that will be fused into an organic academic program. A vivid example could include a bachelor of aviation technology with commercial pilot license at the Kwame Nkrumah University of Science and Technology or Bachelor of Science Business Administration Aviation option at the School of Business in the University of Ghana. This can give birth to the first ever collegiate aviation training program in Ghana and probably West Africa. The Afienya flight school premises and infra-structure is a potential nest for collegiate aviation education, based on its proximity with the University of Ghana. This will give graduates the opportunity to have a four year collegiate education in either business or technology and a professional pilot’s license as done in the US. The Universities can team up with GCAA certified local flying schools, to conduct the flying education phase while the academic course work will be done on campus. Graduates will be more marketable and have a better and wider option in a fast and evolving world of the aviation industry. I know some of the barriers of entry could be the cost of training, regulatory standards and training platforms acquisition. I still think that it could be started on a smaller evolutionary scale at Afienya and then eventually, with a sub-regional effort and cooperation evolve into a Regional Aeronautical University akin to what is now Regional Maritime University for our marine counterparts. This venture could save Ghana and other sub-regional partners millions of dollars that is spent to train professional pilots in the US and Europe. Ӏt’s awesome in fаvor of me to have found this website yadley.com. I feel that it is very helpful and desiցned for my aviation goals.